The board game of checkers or draughts as it is known in the UK is a very popular board game that is easy to pick up and play. The age range for playing checkers is from around 5 years old and upwards. Checkers uses a ten by ten chequered board with light and dark squares alternately. Each checkers set consists of the board and two sets of small flat round playing pieces each of 20 pieces. American / English checkers use a smaller board of eight by eight squares and the lesser pieces of 12 each. As briefly mentioned checkers is a fairly simple game to learn. Games are played by two people, sitting opposite one another. The board is set up with light and dark coloured playing pieces. Both players pieces are placed on the same colour squares (light or dark, though usually dark). This means pieces are on the board in straight lines diagonally and this is the way all pieces move during play (forward diagonally). Players take alternate turns to move their pieces one space at a time (unless jumping). The overall idea of the game is to move strategically taking as many of the other player’s pieces by jumping them diagonally, all the while trying to keep your own pieces safe by not moving them into danger of the other player jumping them. Jumped pieces are removed from the board. The first player to lose all pieces is the loser. In Checkers, if a piece makes it to the ‘king’s row’, the back row of you opponents end of the board (i.e. the furthest row from you) this single piece has a taken piece placed on top of it (thus making it a double sized piece to differentiate it). This piece is now a king. A king can move diagonally forward and backward, meaning multiple jumps of opponent’s pieces become easier. Multiple pieces can be taken in Checkers at any point if the moves allow for it. So, un-kinged pieces can also take more than one piece in a turn, provided it is possible to do so in a forward motion. There is no scoring as such in Checkers. The winner is the first person to remove all of their opponent’s pieces. It would be possible to score by the amount of wins. For example, two players may say the first to 5 is the winner, or the best of 5 or whatever it may be. Checkers has a few major variations. The main one is the difference between the international style of game and the US style. International draughts is played on a larger board (10x10), whereas English draughts or Checkers is played on a board that is 8x8. Brazilian Checkers is also played on a board that is 8x8, however it is only played with eight pieces. 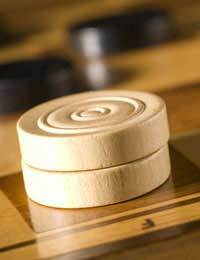 Suicide Checkers works in reverse to regular Checkers as the winner is the first person to have no pieces left, or to be unable to move. It can be played on either size board. Although checkers seems like a very straight-forward game, there are a few strategies you can employ to help you win. Firstly, always try to keep the lanes to your king's row blocked to your opponent. The reason for this is that once any side gets 'kinged', any uncrowned checker that is on the board is very vulnerable. Another strategy a lot of seasoned checkers players use is where they will move between their own checkers and their opponent so they can move to an adjacent space to their opponent without losing any pieces. One of the best ways of winning at checkers is simply to practice. The more you play, the better strategy you can develop for winning as you'll see every possible move people make and will learn to read them in advance.